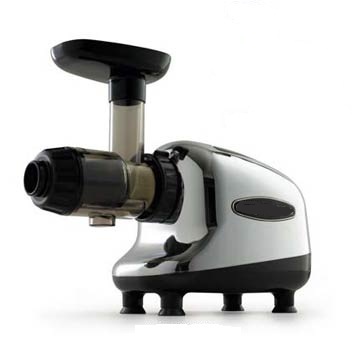 Single gear juicers are also known as single auger or masticating juicers. They have many functions making them quite popular. These machines use a single auger that rotates in a forward action. This action chews grinds and kneads produce into a pulp then pushes it through a stainless steel mesh screen which separates the juice from the pulp. Because these units run at a low RPM (80-120) they create little heat when being operated. This is important because slow rotation and less heat help preserve the nutrients and enzymes in the juice retaining much of its healthy goodness. Low speed also helps eliminate oxidation that occurs in high speed machines such as centrifugal units. It is like that freshly cut apple that turns brown when left on the counter. Oxidation simply depletes juice of its natural goodness literally speeding up the spoiling process, so the less oxidation the better. A good single auger juicer will be able to juice a wide variety of produce including leafy greens and wheat grass. Most masticating juicers can also homogenize foods to create baby foods, nut butters, sauces, frozen desserts and some even offer attachments to extrude pasta. Please note that we are not knocking centrifugal juicers as they still produce a very healthy beverage compared to processed store bought juices but it is important to know that the juice they produce are more oxidized due to their high rotating speed. Masticating juicers are a nice middle of the road choice as they are usually more expensive than centrifugal juicers and less expensive than twin gear juicers. Check out why the Green Power Juicer is one of the best twin gear juicers out there and why they are worth the purchase.